From the Plaza de Armas, find Gatos Market and the big cathedral and walk up the street called “Triunfo” that runs between them. From there it’s a straight shot up. Continue through the alley way with the 12 Angled Stone, past Jack’s where the street turns into Cuesta San Blas & finally up to the Plaza San Blas. If you need some help getting around, feel free to contact steve@themeetingplacecusco.com. 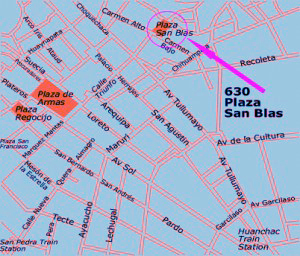 By taxi: Every taxi driver will know where the Plaza San Blas is and you shouldn’t pay more than S/4 from anywhere near the center of town, including the Plaza de Armas.